“We’ve been waiting for a long time and with great anticipation for Lyft to finally file for an IPO. And, boy, the ride-hailing giant did not disappoint. According to documents filed with the Securities and Exchange Commission, Lyft’s financial performance has surpassed our general expectations regarding growth and, perhaps more surprisingly, pathway to profitability. The company said it generated $2.16 billion in revenue last year, which represents a compound annual growth rate (CAGR) of 151 percent since 2016. Moreover, Lyft has controlled costs better than we expected with a mild CAGR of 16 percent over the same period.” Says Alejandro Ortiz, a Research Analyst, Private Investment Research for SharesPost Research LLC. Prior to joining SharesPost, he was a Valuation Analyst at Duff & Phelps with a focus on TMT industries. Axxcess began to follow SharesPost in the third quarter 2018 and they were a invited to be presenting sponsor at our annual Axxcess Advisor Conference in November, in Carlsbad California to introduce their strategy to the professionals working on the Axxcess Platform. Individual investors interested in private companies to a closed end, continuously offered mutual fund which is available at most brokerage firms, called the SharesPost 100 Fund Class I (PIIVX). To read more about a fund that invests in private companies, and is invested in Lyft, please follow the link below. The link below contains information, including the funds prospectus, which details the funds risks and expenses. Risks of investing in non-public companies are significant, including the risk of losing the entirety of your principal, and are not suitable for everyone. Please reach out to your Advisor for more information on your particular situation of if you want to learn more. Past performance is not an indication of future returns. Do you remember life before the internet? Back when you had to look up businesses in the Yellow Pages and call your out-of-state relatives to know what was going on in their lives? It really wasn’t that long ago. So much has changed in such a short period of time. Think of how many companies exist today that couldn’t have existed before the internet. Think of how many jobs the internet has created, how it has fueled the economy, and how much money investors have made by investing wisely in the emerging technology and various ways of doing business. Though the internet may seem like last century’s news, it is still morphing and growing, allowing investors to get in on the ground floor for this century’s technological and business innovation. What does this century’s internet look like? Not AOL, that’s for sure! Today we are seeing a change in infrastructure to cloud-based models and mobile technology. Gone are the days of desktop computers and installing expensive software. Today’s generation wants the freedom to both work and play wherever and whenever they like. The rising use of shared technology and internet-based products and services represents a shift that could prove very profitable to investors who recognize it. We have moved from accessing the internet through our computers to using our cell phones and smartwatches. And we are not the only ones connecting to the internet. Our cars, appliances, even our thermostats now connect and exchange data electronically. This is called the Internet of Things, a network of physical devices embedded with electronics, software, sensors, actuators, and connectivity that integrate the physical world into our computer-based systems in order to make our lives easier. This is the internet of tomorrow. We are living in the Information Age, and information is only getting more important. In fact, we have so much of it at our fingertips that it has led to the rise of big data, where advanced data analytics are used to extract value from the vast stores of data now available to us. Big data has turned internet marketing upside down and is also used to recognize business trends, fight crime, and even prevent disease. All of this information has also led to the rise of artificial intelligence, where our technology is continuously learning and improving, carrying us further into the future. The future of the internet, data, and technology is very exciting. And you can become a part of it without being an IT specialist or a data analyst. As an investor, you can help fund today’s innovations to make tomorrow a better place. If you would like more information about investing in Web x.0 and how this ETF might fit into your portfolio, call us at 858.217.5347 today. Kevin Manzo is a Financial Advisor with Axxcess Wealth Management. Kevin’s services are especially valuable to business owners, high-income and high net-worth professionals and their families. After 12 successful years as a portfolio manager and advisor, Kevin has the knowledge and experience to help clients protect what they’ve worked for, enjoy a comfortable retirement, and leave the legacy they choose for their heirs. Along with his Bachelor’s of Business Administration degree in Finance from Chapman University, he also holds the Accredited Investment Fiduciary® credential, signifying his commitment to upholding a high level of fiduciary care for his clients. Based in Fullerton, California, he serves families and business owners throughout North Orange County and Los Angeles. Learn more by connecting with Kevin on LinkedIn. 2007 was a landmark year as the 9th of October marked the peak of the stock market (Dow Jones). Crunchy leaves weren’t the only thing beginning to fall in October, though. This time also marked the beginning of a significant decline. Backtrack a few years to 2001. Following 9/11, the U.S. stock market experienced a bull market from 2002-2007. Then in March 9th, 2009, the market bottomed out with the Dow down 54% since October 2007. Maybe people lost their jobs. Others lost their retirement savings. Understanding the past declines in the stock market can certainly help you temper expectations and stress test your portfolio. Stress testing is a method for exploring how your portfolio will perform during a financial crisis. This is widely used by the banking industry and finance professionals. The banking, credit, and real estate industries were to blame in the 2008-2009 decline in the market, but there are measures that could have been taken to prevent a crash. Many analysts admit that the lack of proper asset allocation and stress testing contributed to bigger losses for individual portfolios. The Monte Carlo Simulation (or Monte Carlo Method) is a popular simulation to stress test and guess certain outcomes in a portfolio, used in the finance industry. This method helps you see the possible outcomes of your decisions and assesses the impact of risk. In retirement, the Monte Carlo Simulation is valuable in determining the probability of running out of money, based on various asset allocations. Let’s look at a stress test example for a retirement portfolio. When planning for retirement, the first step, although an obvious one, is to determine how much savings you’ll need to live comfortably in retirement. Most people don’t realize that the accumulated amount isn’t the important number, but rather the income it will generate in retirement. As an example, an investor saves $1 million and plans to retire in five years. Let’s assume a 5 percent withdrawal rate at retirement, giving this investor $50,000 annually of income. Now let’s also project (or stress test) a 25 percent loss in the portfolio. The new accumulated asset will be $750,000, which will now generate $37,500 annually. This is a loss of more than $1,000 of retirement income every month! Utilizing a Monte Carlo Simulation or other method of stress testing, one could plan with possible ways to minimize loss and risk. Perhaps if a simulation shows the portfolio increasing in a certain asset class, and reducing in another asset class, the portfolio may lose only 15 percent of value rather than the 25 percent previously suggested. This might be increasing or decreasing in a sector or industry, such as oil or real estate. Rather than a sector, it may be changing the allocation for equities, bonds, hedge funds, or options. We also utilize tactical managers in addition to our own internal approach. There is no way to predict with certain what the stock market may do in the future, but through stress testing your portfolio with simulations you can certainly be prepared. We can show you a snapshot of your current portfolio and the probability of reaching your goals, therefore allowing you to make changes to improve your chances of success. You can call me direct at Axxcess Wealth Management at 858.217.5347 and we’d love to help you. Click here to take a risk survey to see how financially prepared you are. Kevin Manzo is a Financial Advisor with Axxcess Wealth Management. Kevin’s services are especially valuable to business owners, high-income and high-net-worth professionals and their families. After 12 successful years as a portfolio manager and advisor Kevin has the knowledge and experience to help clients protect what they’ve worked for, enjoy a comfortable retirement, and leave the legacy they choose for their heirs. Along with his Bachelor’s of Business Administration degree in Finance from Chapman University, he also holds the Accredited Investment Fiduciary® credential, signifying his commitment to upholding a high level of fiduciary care for his clients. Based in Fullerton, California, he serves families and business owners throughout North Orange County and Los Angeles. Learn more by connecting with Kevin on LinkedIn. 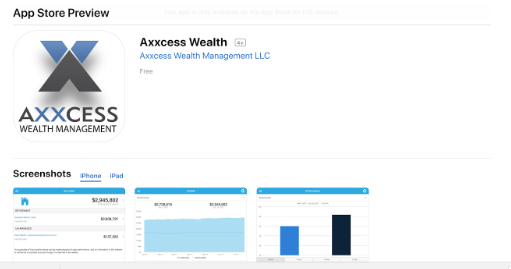 With the Axxcess Wealth Client App, you can review your portfolio’s performance in great detail and always know where you stand. 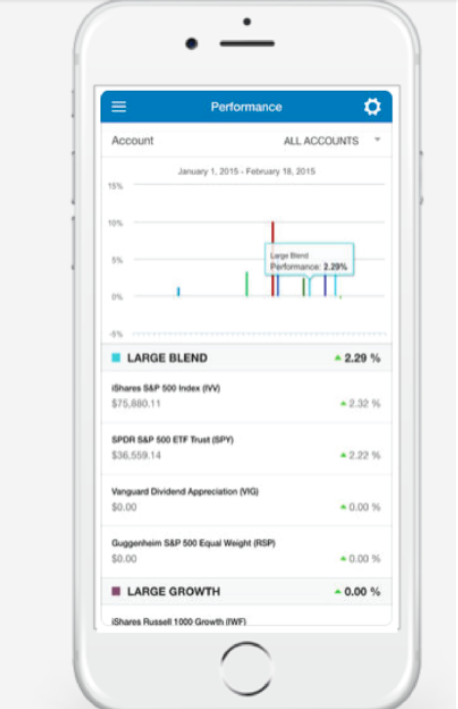 Track your progress and review your holdings like never before. Don’t miss out on this cutting-edge technology for the wealth management world. No need to find a computer to see how you’re doing, just pull out your phone. You can download our custom app for iPhone, Android and Windows Phone devices free in your app store today. If you have any questions, feel free to contact us at 858.217.5347. Self-driving cars, personal gene mapping, smart robots; these are all things of the future, things that our parents couldn’t even imagine when they were children. But now they are becoming a reality. Today’s visionaries are bringing the future into the present. Luckily for you, you don’t have to be a scientist or inventor to be a part of this movement. As an investor, you can help fund and drive the innovation that is forever changing the world in which we live. You can be a part of the Genomic Revolution, Web x.0, and Industrial Innovation. You can help bring the entire world access to the cloud, make autonomous electric vehicles commonplace, and bring to market effective drugs for fighting terminal illnesses. You can make these life-changing innovations possible. Innovation is the key to growth, so by investing in innovative companies you also have great potential for financial returns. Our new “sharing economy” that we have today will increase the utilization of fixed assets, shrinking demand in some sectors while boosting total factor productivity and returns on investing capital. Investors who understand how disruptive innovation affects the economy and the opportunities that it provides are a step ahead of the rest. They are the ones who will reap the greatest rewards from society’s advancements. And you can be one of them. If you want to invest in the innovation that is shaping our modern world, we can help. At Axxcess Wealth Management, we have investments available to us that present the best risk-reward opportunities among companies that rely on or benefit from the development of new products or services, technological improvements, and advancements in scientific research. Call us today at 858.217.5347 to see how you can help lead the world through disruptive innovation.